I love outdoor art. I especially love MacKenzie Thorpe’s work. 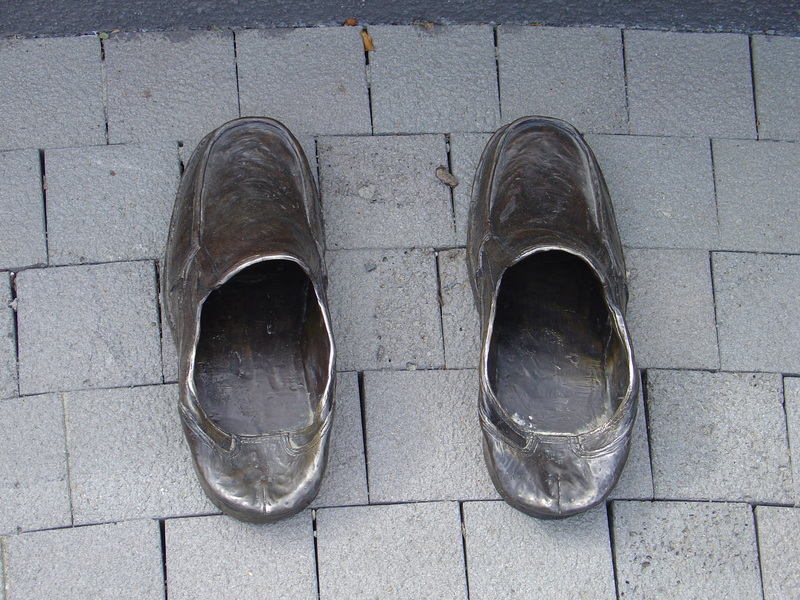 While we were holidaying in Christchurch several years ago we visited the Dyslexia Discovery Exhibit to see his bronze sculpture, “Falling in Love.” I wandered around looking, touching and reading about the other sculptures. Because words have played such a large part in my life, I found the whole exhibit very moving. I took photos of each exhibit and placed them on our kitchen fridge, by my work desk and on my writing desk – just to remind me that when I’m searching for a word it’s only a momentary lapse, not a life long struggle. So that’s how I came to have a photo of a pair of shoes. So…….. stay with me I’m getting there! I looked through her website to organise the link and came across one of her poems which immediately struck more of an orchestra than a chord with me. And then I thought her page was bare of photos and wondered whether I had anything appropriate in my collection ……….which leads us back to the shoe photo and the word connection! Long-winded but I got there. I hope you enjoy reading Alyson’s poem and having a wander through her web site.